The home was built in 1855, six years before the Civil War. The Civil war brought an end to the good times of the era and caused great hardship for the people left at home on the Mississippi Gulf Coast from 1861 until 1865 and for many years thereafter. Pass Christian and the other coast towns during this time became towns of women, children and old men. The third and seventh Mississippi Infantry Regiments took most able bodied men between 16 and 60 years of age as conscripts and marched them off to the war within the state of Mississippi and later to other parts of the South where the war was raging. Then the coast cities with little defense for its people was invaded and occupied by the Union troops stationed on Ship Island, located 12 miles off the coast. The coast was blockaded at once by the Union and all supplies were soon exhausted throughout the coastal area. During the Civil War era, following the occupation of Pass Christian by Federal Troops, Pierre Saucier's home located on the beach front at 242 East Beach in Pass Christian, Mississippi, was confiscated by a Union detachment and used as the Union Army Officers Residential Quarters and local Office until the troops moved on to Biloxi. Afterwards, the home became known as Union Quarters, a name it retained for over 140 years, until its destruction by Hurricane Katrina in 2005. The Pierre Saucier home, Union Quarters, a magnificent old plantation style home on the beach front was listed in the National Registry of Historic Places as having been built in 1855, six years before the Civil War, by local Pass Christian merchant Pierre Saucier. Its site, facing the Gulf of Mexico, was chosen by Pierre due to the nearness of the towns harbor and its wharves which were located a short walk from the chosen site for his home. The new Chattanooga Railroad's depot for Pass Christian was to be located to the rear of the property which was another advantage for his business pursuits. The large home he constructed was an impressive, two story, white wood frame, double-pile, Greek revival dwelling distinguished by its one bay pedimented portico which was set against the inset gallery. It was adorned with a cast-iron filigree balustrade. It's beautifully landscaped lawn stretched down to the waters edge of the Gulf of Mexico. In later years, a white cast iron fence fronted the shady and well manicured property and a Historical Marker reading, “Union Officers were temporarily quartered here during the invasion of Pass Christian”, was located just inside the fence. The marker was installed and dedicated in 1960 by the State Historical Society to commemorate the events of 1862. Next to Union Quarters, on its west side, was a two story four room frame cottage which was built several years after Pierre completed the main house and used by family members and visitors. Pierre Saucier’s home and property holdings at onetime included all the land of downtown Pass Christian, Mississippi. Pierre's wife, Elizabeth Nicaise, had died in 1860, before the Civil War began. Pierre now a widower with two young sons still living at home was sharing his home with members of his older sons' families after the war started. His older sons had joined the local Confederate military unit, the 3rd Mississippi Infantry, as soon as the war began and were patrolling the coastal area with their unit at the time the Union troops took over Ship Island and invaded the coast. The first engagement with Union troops was when the 9th Connecticut Infantry invaded Pass Christian by boat from their encampment on Ship Island on Thursday April 3, 1862. As the two Union gunboats, a sloop and a troop transport, drew near the shore, a few Confederate troops attempted to burn the wharf, by setting hay bales on fire in an effort to prevent the Union gunboats and troop transport from landing. The Union forces mistook the smoke for a Confederate battery firing at their approaching boats and opened fire on Pass Christian with their cannons. Most citizens fled the town to safety when the shelling began leaving the town empty. A few houses suffered heavy damage, but no citizens were injured in the shelling by the Union gunboats. The “bed sheet surrender” apparently stopped the shelling of the beachfront dwellings by the Union gunboat, the USS Massachusetts. A beachfront resident signaled to the Union gunboats to cease their shore offensive by waving a white bed sheet as a signal of surrender from the balcony of her home. This event became known by locals as "the bed sheet surrender of Pass Christian". ​During this first foray into the town of Pass Christian, the Officers of the 9th Connecticut Infantry commandeered Pierre Saucier’s home for their brief one day and one night stay before retreating back to Ship Island and did not return to the town until after the war, returning at the beginning of Reconstruction. ​Later the Union officers while at the Saucier home received the news that they had not been fired on but the smoke had been merely burning hay bales on the towns' wharves. An apology was then issued to the town for the shelling of the beach front by the Union Commander. After profuse apologies were made, the Union officers and soldiers withdrew to Ship Island and their encampment. The Union soldiers, numbering slightly over 1,000 men had landed at the harbor on April 3, 1862, and immediately set out in pursuit of the small Company of the 3rd Mississippi Infantry troops camped near the town. The main body of the 3rd Mississippi had previously marched toward Biloxi where they expected the Union troops to invade, leaving only a few men at the camp. By the time the Union soldiers landed, the remaining members of 3rd Mississippi Infantry had already retreated to safety north of the town. The Union soldiers entered the city to find the Confederate troops gone and the 3rd Mississippi's camp deserted. The Union forces burned their camp and supplies, destroyed horses, captured the flag of the Third Regiment, Mississippi Infantry, some small arms, and musical instruments left behind in the camp. The captured 3rd Mississippi Infantry flag, captured by the 9th Connecticut Infantry, would finally be returned in 1885, twenty-three years later, during ceremonies in New Orleans. Other Union Army detachments cut the overland telegraph lines and the submerged telegraph cable connecting Mobile to New Orleans. Union soldiers plundered the town before withdrawing, there being little of value, including food for them to confiscate, they soon returned to their ships and Ship Island. The following account by several historians has been passed down in the family as fact for many years and is in fact questionable on its accuracy. "Upon learning in July of 1864, while the ravages of the Civil War were still ongoing, his four oldest sons away serving in the Confederate Army, Pierre Saucier received news that one of his sons was seriously wounded at Vicksburg. Pierre hurried to Vicksburg to accompany his son home to recover. On the return trip home, his son died from his wounds, followed by his grieving father's death after he collapsed in the railcar. The grief of losing his son was too much. It was the bodies of both father and son that later arrived in Pass Christian, each packed in charcoal filled boxes. Following a Funeral Mass and services, both were buried in the family cemetery at DeLisle". In 1865 with the war now ended, Pierre's sons had returned home to their families, resuming their lives the best they could. With Pierre's death occurring the previous year, Anatole James and his family were now occupying the main house. During the start of the Reconstruction Era that followed the surrender of the Confederate States, Union Officers and a detachment of soldiers were dispatched from the Union Army encampment at on Ship Island to occupy and control the city and coastal areas. It was at this time the Union Officers seized the Saucier home for their headquarters. This was the second time the Union Officers had used the Saucier home as their headquarters, but this time would prove to be a much longer occupation of the Saucier home. As the Union's 9th Connecticut Infantry soldiers from Ship Island were beginning their occupation of Pass Christian, Mary Catherine Saucier, Anatole James' wife, upon being told that a company of Union soldiers were approaching their home that morning by the children playing nearby, went into the parlor and nervously started playing the piano, waiting for the approaching soldiers. She was alone in the house when the unannounced Union Officers, followed by a guard detail walked through the entrance doors and into the house. The officer in charge stepped forward, asked for the lady of the house, after which Mary Catherine acknowledged that she was, he then made his firmly requested permission (demand) for the use of the family's beach front home as their headquarters. Mary Catherine knowing her present position and the fact that she had no choice whatsoever in the matter, stubbornly insisted, in spite of her obvious helpless situation, that neither she nor the children be harmed and that the family be allowed to remain in their home. In an attempt to calm her obvious fears and concerns, the Union officer asked her if she could play "Bonnie Blue Flag", a popular Southern tune of the Civil War era. Proudly and defiantly she replied, with a brave quiver in her voice, "I most certainly can". The officer replied, "Then you play it for my men and me and I will give you my word as an officer and a gentleman that no one will be harmed and nothing disturbed in your home". Smiling, the officer offered Mary Catherine his arm, and then guided Mary Catherine to the piano. She nervously played the piano while his staff took over their home. Because the music was pretty, the soldiers had gathered around to listen and became friendly with Mary Catherine and the family members. It is said that Mary Catherine began and ended her lengthy "command performance" with "The Bonnie Blue Flag". Mary Catherine's older daughter, Mary Louise, in later years recalled this event at their home in discussions of the takeover of the family home that day by the Union officers. During this period of time, the Union's General Butler at New Orleans had placed a bounty on the head of anyone caught singing or playing the "Bonnie Blue Flag" and they were to be arrested, fined $25.oo or even imprisoned for doing so, according to the orders Butler had issued at New Orleans. So you can imagine at what went through Mary Catherine's mind after being asked to play it for Union officers and soldiers in her home that morning. Shortly after the encounter by Mary Catherine with the Union troops her husband, Anatole Jacques (James), one of the older sons of Pierre, returned to the house after nightfall in order to remove the family’s valuables and he hid them in the nearby swamp due to the possibility of everything being confiscated by the Union troops. The following morning the Union Officers returned and completed taking over the first floor of the home to use as their living quarters and office area, with the soldiers erecting their tents on the grounds surrounding the house. The seizure and occupation of the Saucier home would have caused great uneasiness in the family members remaining there, due to the family's support of the Confederate Army and so many family members having served in the 3rd and 7th Mississippi Infantries or other units of the Confederate Army during the war. Those members of the Saucier family that remained had to vacate the first floor living area. Mary Catherine, not knowing what to expect from the enemy troops, at first hid her infant son, Anatole Pierre (Paul), in a room on the upper floor out of fear for his safety. The family moved to and lived on the second level and attic rooms of the house for almost two years, until their home was vacated by the Union troops when they finally moved on to Biloxi. This simple request that she play the song, and that her enemy audience appreciatively listened to it, convinced her that these blue coated Union men were human and kind--and caused her to be as gracious as was possible under the circumstances she found herself in. As good as their word, the Yankee officers left with their troops, leaving behind respect instead of hatred in the Saucier home. After remaining for almost two years, the departing Union troops were thanked by family members for being respectful and kind during their occupation of the Saucier home and for not destroying the house and its surrounding buildings. The Saucier home was occupied by the Union Garrison on two different occasions, first at the beginning of the war and then during the reparations era following the war. 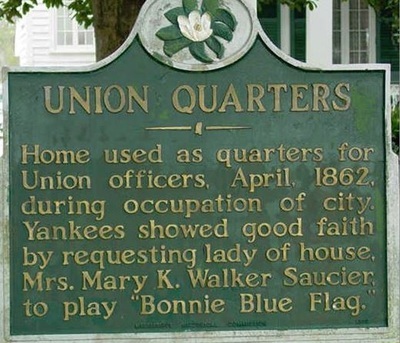 From the time of the first occupation in 1862 of the Saucier home by the Union Officers and troops, it thereafter would be known as “Union Quarters”. The young infant, Anatole Pierre (Paul), who at first was hidden on the upper level during the beginning of the occupation grew up to become City Alderman, Mayor, and Chief of Police during the early 1900's. The Biloxi Herald reported that during a winter vacation in Pass Christian in 1912-1913, President Woodrow Wilson had arrived in Pass Christian by railcar on Christmas Day. The then Mayor, Anatole Pierre Saucier and his family, met the President at the Pass Christian train station. As was reported in the local newspaper's story of the visit, it had rained for several days and water was still standing in the streets when the President arrived. "Some rain you had, Mr. Mayor," remarked President Wilson as they walked from the train station. "Aw, we jes cleaned up the place for you, Mr. President," quipped Mayor Anatole Saucier in reply. A little over seven years after the death of Pierre, Sr., the estate was split and divided between the family members and the large family house was placed on the market to be sold. It was to be auctioned off to the highest bidder by the New Orleans auction firm of C. E. Girardey & Company. When the main house was put on the market to be sold in June of 1870, Anatole Jacques and his family, who had been living there since Pierre's death in 1864, moved into the smaller cottage next to the mansion. Once the home and property was sold Anatole Jacques and his family moved from the cottage to their property on Davis Avenue in Pass Christian. On November 1, 1871, the heirs of the estate of Pierre Saucier, Jean Jacques and wife Sarah Carr Saucier, Anatole Jacques and wife Mary Catherine Walker Saucier, Francois Napoleon and wife Mary Louise Orr Saucier and Evariste Marie Saucier, sold the spacious Saucier manor to Mary Catherine Dawees of New Orleans, the highest bidder at the auction, for the sum of $4,000.00. Mrs. Dawees in turn sold the beautiful mansion to Louisa Jane Bidwell of New Orleans on October 29, 1900 for the sum of $7,500.00. Upon Mrs. Bidwell’s death in 1910, having no surviving family, the home was passed through her will to the children of her close friends, George and Mary Pratt. The elderly Pratt’s continued to live there after their children were grown. On September 15, 1937, Frank Wharton purchased the property to the east, adjoining Union Quarters. He had been operating a grocery store on that property next to the home. In March of 1944, the Pratt Children, after the death of their parents, sold the property, jointly to Frank Wharton and his wife’s Aunt, Margaret McGrath. The aunt owned and operated the Nelson Hotel just down the road on the west side of the home. Frank Wharton and his wife Allie Lee, both of whom this writer was acquainted with, lived in the old mansion and kept the house and its grounds well maintained, aware of the old homes history and heritage. Frank and Allie Wharton opened the old mansion for public viewing during the annual Coast Spring Pilgrimage in Pass Christian, with those conducting guided tours of the home and its grounds dressed in Civil War era attire. The Wharton’s owned and operated the Wharton Hardware in Pass Christian and Wharton's Furniture Store in Gulfport, and in later years were owners of the old Rayner Hotel in Gulfport next to their furniture store which they renamed as the Nelson Hotel. Their hotel and furniture store was demolished in the 1980's during the urban renewal project in downtown Gulfport. Their daughter Ann sold Union Quarters after the death of her parents in 1990 to Heinz and Francis Hoffman, who restored the mansion to its former magnificence and lived there until early 2005. 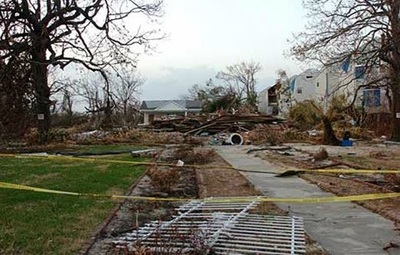 Unfortunately, the old Pierre Saucier home, Union Quarters, which had survived so many hurricanes of the past, was completely destroyed by hurricane Katrina and its thirty foot storm surge on August 29, 2005. Only a few bricks and a pile of rubble remained of what had once been the stately old mansion, located on the edge of downtown Pass Christian, Mississippi. The old home had just been sold to new owners who were in the process of closing on the deal when the home was destroyed. The old mansion was not rebuilt. As of February 2016 the beach front property is still vacant. The white cast iron fence fronting the well manicured property facing the Gulf of Mexico has been replaced, serving as a reminder of what once was the location of Pierre Saucier's home, Union Quarters. The old historical marker installed in 1960 inside the fence near the roadway was also returned to the front lawn where it had greeted so many visitors to Union Quarters in the past. In 2013 a new plaque was installed outside the fence near the roadway by the Mississippi Department of Archives and History to mark the former location of the home, stating that this was the location of the Saucier - Bidwell - Pratt House, with a short history of the home, replacing the old plaque. On the reverse side of the new plaque is a drawing of the former home. Unfortunately, the new plaque, installed in 2013, has some incorrect information listed on it. The new plaque reads "Built ca. 1855 by Pierre Saucier, whose son was later Mayor of Pass Christian". The first part of the information is correct, but, the last part of the statement is incorrect; it was Pierre's "grandson", Anatole Pierre (Paul) Saucier, who became Mayor of the city. His son Anatole Jacques (James) Saucier was never the city's mayor. Pierre's grandson also had formerly served the city of Pass Christian as its Chief of Police, Justice of the Peace, Alderman of Ward 4, and served on the Mississippi Seafood Commission as well as operating a Mercantile store within the city. Pierre's grandson, Anatole Pierre (Paul) Saucier, passed away in 1944 at the age of 79. In 1960, Miss Mary Louise Saucier, still living in the old family residence on Davis Avenue, celebrated her 90th birthday. As one of 10 children of Anatole Jacques and Mary Catherine Walker Saucier, during her birthday event, she reflected on the family story of events that occurred so many years before, that had been told to her by her mother. "Mother was in the parlor playing the piano when the Union soldiers walked in. Because the music was pretty the soldiers gathered around to listen and became friendly". She explained that her parents had lived in the large Saucier home when they were first married, "but moved to the west side smaller house once the big house was sold". At her advanced age, Mary Louise Saucier had fond remembrances of when her mother played the Bonnie Blue Flag for the soldiers on that day so many years ago. Mary Louise Saucier passed away at the age of 92 years on Monday December 30, 1962 at Memorial Hospital in Gulfport. One younger brother, Robert Joseph Saucier, a bachelor, survived her and he passed away on April 8, 1969 at the age of 84, still residing at the old family residence on Davis Avenue. “The Bonnie Blue Flag will again fly at Union Quarters on the beach front at Pass Christian when the antebellum home opens for the annual Spring Pilgrimage (March 1979). An old flag pole on the front lawn from which the U. S. flag has often flown has been replaced with a new 40 foot pole. Now the Bonnie Blue, long associated with the history of the old home will fly beneath the Stars and Stripes”. “According to historical records a song entitled “Bonnie Blue Flag” was a popular tune when a Conference was held in Jackson on January 9, 1861, to decide whether Mississippi should secede from the Union. When word came that the vote was in favor of secession, ladies in Pass Christian decided to make a Bonnie Blue flag as a symbol of the State’s Independence. The 3rd Mississippi Regiment was camped and in training at Pass Christian at the time. The American flag was lowered and the Bonnie Blue was raised in its place on the beach front property, now owned by the Wharton family, which at the time of the war was owned and occupied by Pierre Saucier and his family”. From reading the old article this writer is given the impression that the “Bonnie Blue” was raised for the very first time after its creation by the town’s ladies on the grounds of Pierre Saucier’s home which in the future would be known as Union Quarters following its occupation by the Union troops on two separate occasions during the war. The photo on the left shows the historical marker that was located just inside the iron fence fronting the property. 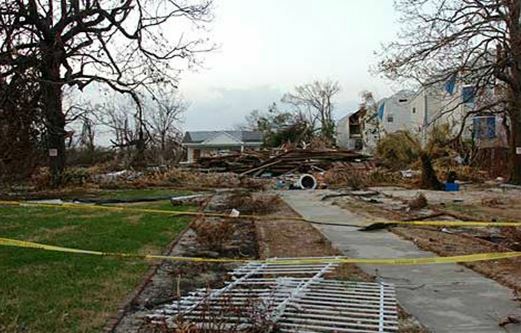 The photo on the right was taken on December 10, 2005 and shows what remained of Union Quarters following Hurricane Katrina's destruction of Pass Christian and the Mississippi Gulf Coast. "The Story of Union Quarters"